Have you ever wondered what lies on the middle floors of the Campanile? No, it’s not a portal to the Twilight Zone. But if you venture off the elevator on floors two through four, you’ll take a leap back in time. A quick scan around each dusty, cavernous room takes you back almost a century. On the floor lie browned, brittle scraps of The Bakersfield Californian, circa 1920, containing ads for flapper dress shops and 75-cent hotel rooms. The shelves on the wall take you back even further: they are piled high and deep with the fossilized bones of extinct animals from prehistoric California. The storerooms of the Campanile, also known as Sather Tower, house fossils that were collected by UC Berkeley scientists starting at the turn of the 20th century—some 300,000 specimens in total. Understandably, many of the storage units have now deteriorated to the point that they jeopardize the fossils they contain. Thanks to a recent grant, the University of California Museum of Paleontology (UCMP) at Berkeley launched an initiative to restore and curate a critical portion of the collection. Students and scientists from the UCMP are studying these fossils to learn about evolutionary processes and how climate change has affected different animals in the past. 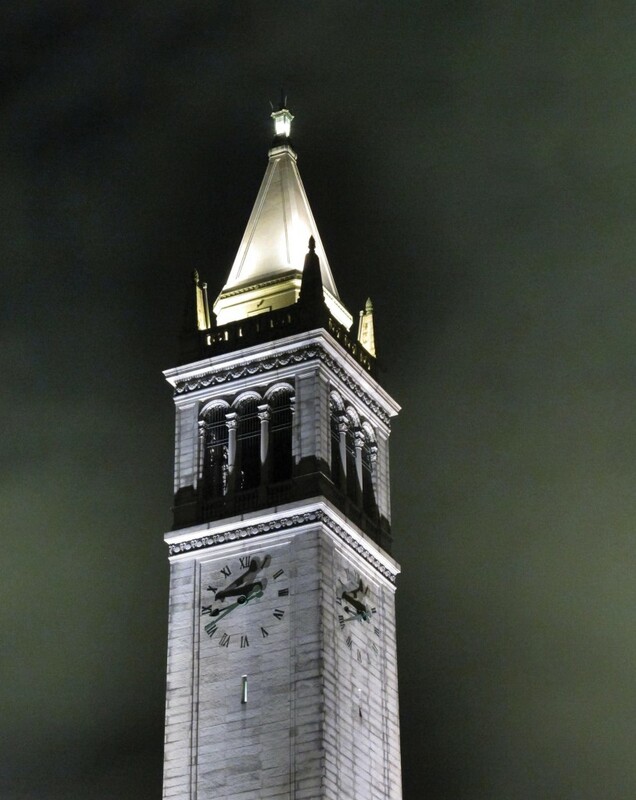 The project coincides with the 100th anniversary of the Campanile to offer a glimpse into UC Berkeley’s tradition of exploring prehistory. UC Berkeley’s history of fossil collecting began in the early 1900s. Professor John C. Merriam, one of the founders of the UC Berkeley paleontology program, conducted extensive excavations at the then newly discovered Rancho La Brea fossil site outside of Los Angeles. Thousands of years ago at La Brea, pits of natural tar trapped animals, thereby allowing their skeletons to sink to the bottom and remain intact. From 1905 to 1913, Merriam collected a plethora of well-preserved La Brea fossils that are up to 23,000 years old, dating to the middle of the last ice age. In 1914, he shipped his collection—about 20 tons of fossil material—to Berkeley to seed the department’s fledgling paleontology collection. The collection was already too extensive to reside within the Department of Paleontology, located at that time in Bacon Hall. Fortunately, a new bell tower was under construction nearby. The Campanile provided a generous amount of storage space for Merriam’s collection. La Brea fossils would ultimately occupy three of the four tower floors dedicated for storage. The collection remains there today and is frequented by visiting researchers. After the establishment of the UCMP in 1921, UC Berkeley’s fossil collections continued to grow. In the 1930s, Merriam conducted excavations at another California site near the town of McKittrick in the San Joaquin Valley, where more bones had been found in tar. The bones at the McKittrick site were initially thought to have come from modern day livestock. Merriam was the first to recognize the remains as fossils. His fieldwork at the McKittrick site provided another floor’s worth of material to the Campanile’s fossil holdings. Unfortunately, the McKittrick collection has received little attention over the decades, and without upkeep, its condition in the tower has deteriorated. When I visited the McKittrick collection in the Campanile, I was struck by how haphazardly the bones had been stored there since their transport to UC Berkeley in the 1930s. As a graduate student in Berkeley’s paleontology program (now housed in the Department of Integrative Biology), I am accustomed to modern standards of fossil curation that involve great care to preserve delicate specimens. But in the tower, there are countless bones piled on open trays, sitting on decaying wooden shelves. I was accompanied by Eric Holt, a fellow graduate student in integrative biology. Holt was one of several Berkeley students who were hired over the summer by the UCMP to move, prepare, and curate the McKittrick collection. Holt recalls the state of the collection when they first started moving it. “Some of the shelves had collapsed under their own weight over time. There were dead birds, piles of open drawers, a lot of stuff just stacked in cardboard file boxes,” Holt says. Moving the fossils required much heavy lifting amidst clouds of dust to carefully transport the fragile specimens. The McKittrick fossils are challenging to restore because they are largely fragmented. Unlike the deep pits at Rancho La Brea, the tar at McKittrick seeps from geologic faults in thin layers over the ground, like a lava flow. The animals that died there were stuck at the surface. “Even after they died, they were still exposed to the elements and scavengers until rain washed sediment over their remains,” Holt explains. “A lot of the bones are broken because they didn’t sink and weren’t preserved together.” The McKittrick material therefore required some detective work to identify the bones and the groups of animals, or taxa, that they represent. Despite the tedious and labor-intensive work, Holt approached every step of the process with staunch enthusiasm. 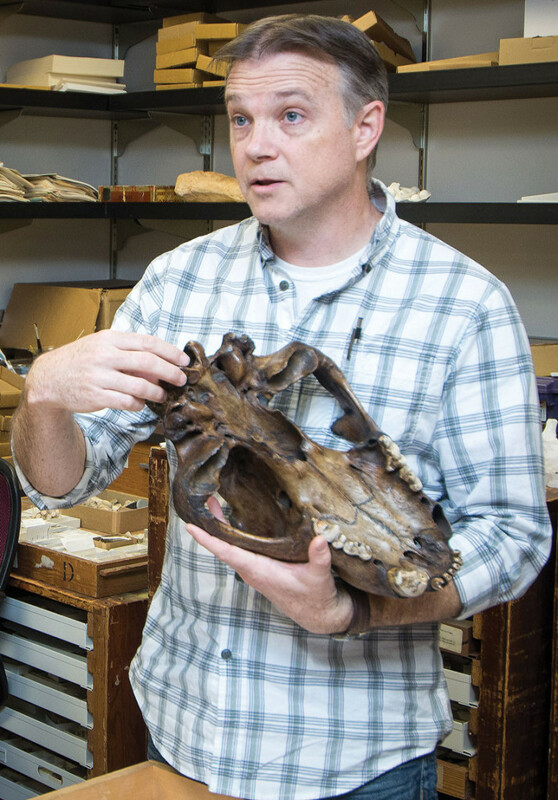 Having come to UC Berkeley in his forties to complete his bachelor’s degree and pursue his passion for natural history, Holt was like a kid in a candy store among these fossils. “Every time you open up a cabinet, it’s like Christmas morning!” he says with a grin. Back in the Valley Life Sciences Building, where the UCMP now resides next to a full-scale T. rex skeleton on display, Holt showed me a tray of McKittrick fossils that he had prepared. Using the UCMP’s comparative collection of extant, or modern, animal skeletons, Holt was now working to identify each bone and figure out the animal from which it originated. As an example, Holt offered a bone the size of a bowling pin that he had identified as the humerus (upper arm bone) of an American lion, a species that lived in North America during the last ice age. Holt also got a taste of California’s modern history by working on the McKittrick collection. He found interesting vignettes from the time of Merriam’s excavations in the newspaper clippings on which specimen data were recorded in the field. 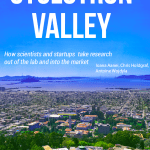 “There are a lot of odds and ends of history that are included in this collection of prehistory,” he muses. 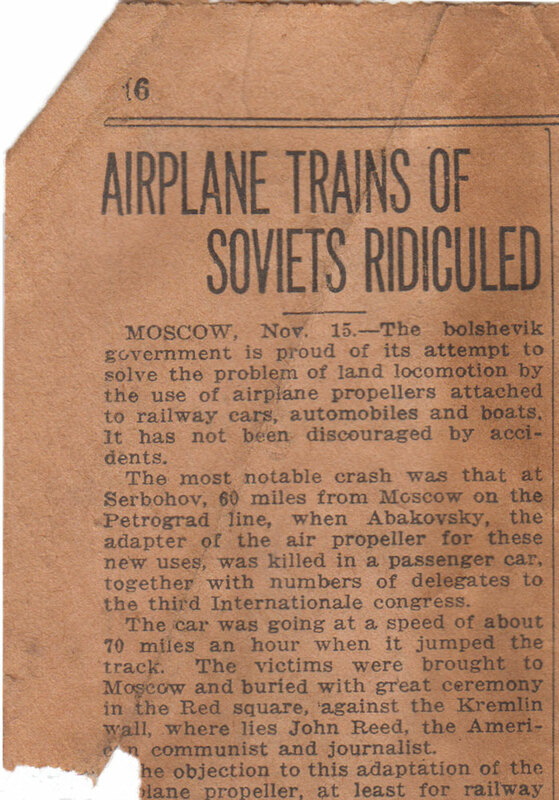 One scrap contained a brief account of an attempt by Bolsheviks to attach plane propellers to a train, which caused the train to derail on its way to a showcase—“something I would never have learned about otherwise!” Holt has also glimpsed historic events at UC Berkeley. “I came across a little slip [that contained]—because this was before television—an actual play-by-play account of a Cal game. The date was from 1922, which was one of Cal’s divisional championship seasons.” As part of the curation effort, UCMP students have scanned all of the newspaper scraps associated with the McKittrick fossils and will include them in the digital archives for the collection. After a summer of hard work—over 3,000 collective hours by 14 staff and student employees—the entire McKittrick collection of almost 12,000 specimens will soon be accessible online. Some of the specimen photos are already available through Cal Photos, with each photo linked to the digital archive of the fossil in the UCMP database. “It’s been a lot of work, but it’s an investment,” Holt says. “Down the road, it’s going to enable researchers throughout the rest of the world to be able to possibly get the information they need from the image.” This option will save time and money for scientists who want to study the fossils. Most of the McKittrick collection has now been moved to an offsite warehouse facility in Richmond. The fossils reside there in new cabinets in a climate-controlled storage area for posterity. The collection is available to researchers who wish to examine McKittrick fossils in person. We have much to learn from the McKittrick fossils. Little research has been done on the collection thus far, and, according to Holroyd, the information we do have comes from studies that were conducted at least 50 years ago. Even the relative age of the McKittrick fossils has long been dubious. “There was one date in the literature previously suggesting that McKittrick fossils were 40,000 years old or more,” says Berkeley alumnus Robert Dundas, associate professor in the Department of Earth and Environmental Sciences at California State University, Fresno. An age of 40,000 years would have dated the fossils to the mid-Pleistocene, when much of the Northern Hemisphere was still covered with ice and the climate was relatively stable. However, a more recent study by Dundas and colleagues estimates the age of the McKittrick fossils more accurately using radiocarbon dating, a technique that measures the amount of decaying radioactive carbon isotopes in organic matter. They discovered that these fossils were much younger than previously thought. “We found that the McKittrick fossils actually date to the late Pleistocene or early Holocene,” Dundas says, making the McKittrick fossils about 11,000 to 15,000 years old. This age is significant because it coincides with the end of the last ice age and the extinction of most North American megafauna (animals exceeding 100 pounds) due to climate change and overhunting by humans, among other possible factors. The McKittrick collection is therefore a sample of the diverse animals that existed in California prior to and during the end-Pleistocene megafaunal extinction. The collection includes bones from mammoths, giant ground sloths, giant bears, lions, saber-toothed cats, dire wolves, horses, elk, and even camels. Ashley Poust, a graduate student in the Department of Integrative Biology working with Professor Kevin Padian, is using McKittrick fossils to study the evolution of growth rates in large mammals. “[The McKittrick collection] contains many juveniles as well as adults, and has more than one specimen of most species,” says Poust. This is invaluable for Poust’s study because for each species he needs multiple specimens of varying ages to compare their growth rates. Poust will embed the fossil bones in resin and cut thin sections to examine under a microscope. He can then estimate the age of each individual by counting growth rings that form annually in the bones, like the rings in a tree trunk. McKittrick for his undergraduate thesis. Now continuing his studies as a PhD student with paleobiologist Anthony Barnosky in the Department of Integrative Biology, Holt plans to investigate competitive ecological relationships between North American canids since the end of the last ice age. Holt will examine body size change in coyotes through this interval, because according to recent data, wolves begin to prey on coyotes when they co-occur. “As a response, coyotes tend to be solitary, have smaller body size, and feed on small things like mice and rabbits,” Holt says. If wolves are removed from the ecosystem, however, the reverse trend occurs: coyotes get bigger, group in small packs, and pursue larger prey such as deer. This trend was observed over the last several hundred years as European Americans and cattle ranchers decimated grey wolf populations throughout North America. Holt’s working hypothesis is that a similar trend may have occurred during the last ice age. Pleistocene coyotes were physically larger than extant coyotes, possibly because grey wolves had not yet arrived in North America. 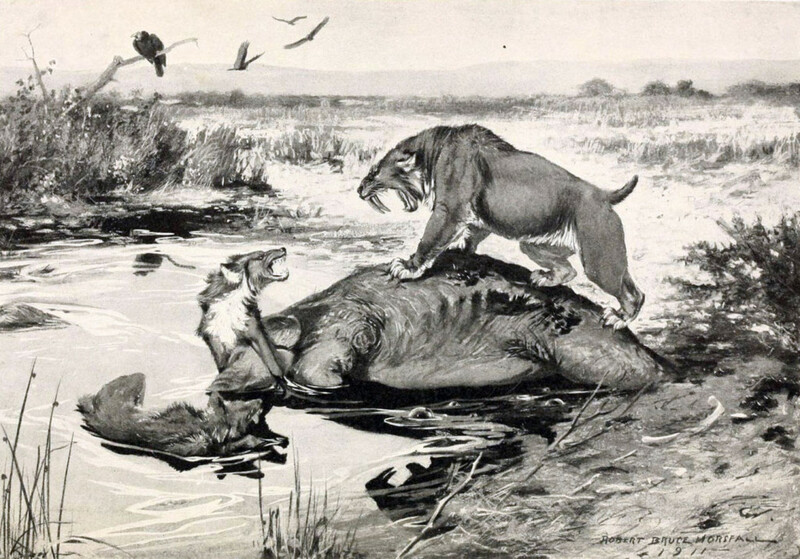 This imagined scene shows a saber-toothed cat (Smilodon californicus, also known as the California State Fossil) challenging a pair of dire wolves (Canis dirus) over a carcass in La Brea some 23,000 years ago. Ongoing research on Pleistocene animals from McKittrick could have implications for the preservation of their living descendants. Holt hopes his research will inform management strategies of large predators, a growing concern among conservation scientists. In the coming decades, it is expected that landscapes in many natural reserves, such as Yellowstone National Park, will shift due to climate change. This means that large predators like coyotes and grey wolves will have to migrate or adapt if their food sources are compromised or their habitats become unsuitable for survival. “A lot of people say, ‘Coyotes are varmints,’” Holt explains, “but they’re carnivores. They play a really important role in the ecosystem.” For example, carnivores help to curb local populations of rabbits and rodents, which can increase exponentially if left unchecked. Inferring competitive interactions between fossil canid predators could influence conservation plans for extant ones. For instance, Holt’s research could help to predict long-term outcomes of coexistence between grey wolves, which have been reintroduced to Yellowstone National Park, and coyotes, which are native to the area, in the context of a changing environment. Biotic response to climate change is the focus of the UCMP’s latest education and outreach efforts. Following the success of its award-winning, open-access educational websites, Understanding Science and Understanding Evolution, the UCMP will launch a third website next year, Understanding Global Change. The new site will use fossils from the McKittrick collection, among other sources, to explain topics such as extinction, evolutionary change, and climate change. “There are so many aspects of the McKittrick fossils that pique curiosity: the way they were preserved, the location they come from, the animals that they represent,” says Lisa White, assistant director of Education and Public Programs at the UCMP. The learning modules of Understanding Global Change will feature lab exercises that allow students to engage with datasets from the McKittrick collection, like Holt’s sample of canid specimens. 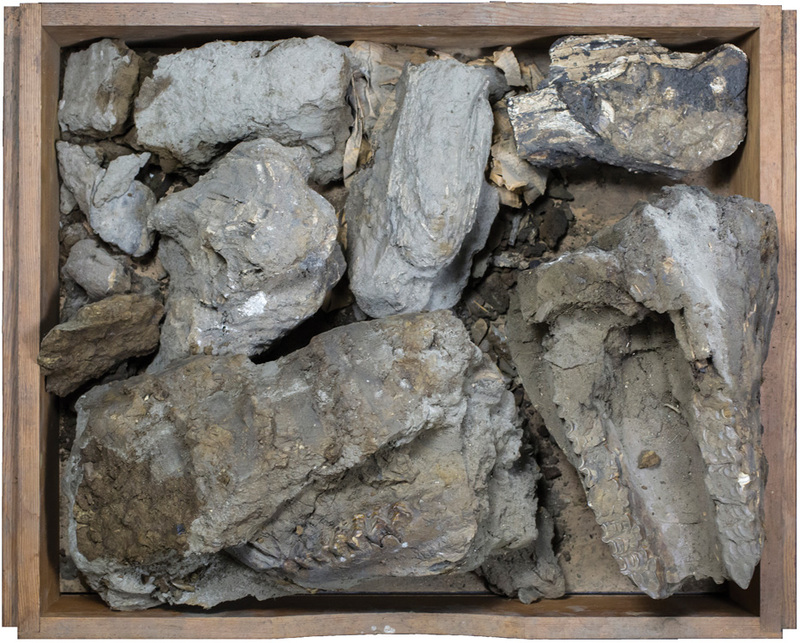 The site will also explain the process of fossil curation and research using examples from the McKittrick collection. White hopes this real-world connection will make the learning experience more meaningful and compelling for students. Rather than featuring isolated episodes from the fossil record, White says, the learning modules are designed to emphasize interactions between animals and their environments. The McKittrick specimens reflect the climate, habitat, and community structure of their environment; the interaction of those variables affected the survival or death of those animals. Scientists and educators at the UCMP want to emphasize how studying these interactions can help us to predict future outcomes of climatic and biotic change. And the McKittrick collection represents only about five percent of the UCMP’s collection in the Campanile. There are still plenty of fossils waiting in the bell tower, surely enough to keep UCMP students busy for the next 100 years.